Academy Award nominee James Cromwell shares stories from his prolific career – about paying for his own Oscar campaign for ‘Babe’ and his upcoming role in ‘Jurassic World’ – & discusses his longtime dedication to protesting in this wide-ranging interview. 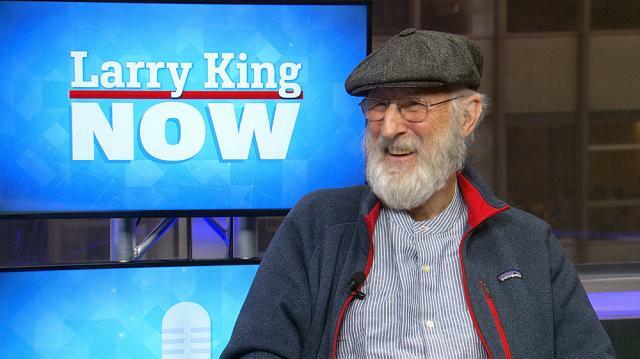 Larry King interview James Cromwell, an Oscar-nominated and Emmy-winning actor whose credits include ‘The Artist,’ ‘The Green Mile,’ ‘L.A. Confidential,’ ‘American Horror Story,’ ‘Six Feet Under,’ and ‘Babe.’ Cromwell stars in the upcoming films ‘The Promise,’ and a ‘Jurassic Park’ sequel. Larry asks if Cromwell remembers all his 178 roles, which Cromwell does. And Cromwell says it does strike him as odd that out of all his roles, ‘Babe’ got him an Oscar nomination. He talks about running his own campaign for best supporting actor, since the studio only wanted to support him for leading actor, a role Cromwell thought belonged to the pig. Larry asks for his thoughts on awards, and Cromwell talks about the honor of being nominated for his acting. Larry asks if he’s always wanted to ask. While Cromwell originally wanted to be a mechanical engineer, he got into acting when his dad took him to a movie shoot he was directing. Cromwell waxes about the performer being a mirror for the audience, and talks about his theater and film roles. Regarding what attracted him to his role in ‘The Promise,’ Cromwell talks about his interest in cinematically recognizing the Armenian Genocide, and talks about his experiences in Turkey. Larry asks him about more of his roles as a character actor, which Cromwell defines as a small, supporting role. He talks about some of his acting roles, and Larry moves the conversation to Cromwell’s activism and progressive stances. Cromwell affirms that he’s getting bolder with age, and relates an instance where he declined to protest the destruction of a wetlands by Steven Spielberg’s studio because of possible harm to his acting career. Then he saw Martin Sheen leading the march and believed he could do it too. Now Cromwell goes to protests and believes he has to stand up for what he believes in. Larry notes that both he and Cromwell are getting older in the business, and asks if Cromwell ever thinks of retiring. Cromwell doesn’t, so Larry asks if there’s anything good about aging. Cromwell talks about a 97-year-old Holocaust survivor he knows, who says you can say anything in old age.